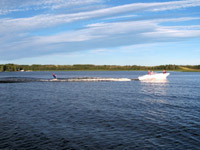 Pine Lake, located southeast of Red Deer, AB, is a small lake in a rich rolling agricultural area with a watershed of about 120 square kilometers. This beautiful lake is home to many summer and full time residents, cottages around the lake shore. This beautiful lake is fed by streams and intermittent creeks during the spring run off and after rain storms. Pine Lake is complex in that during times of drought there is no external water sources, however the water level is maintained by aquifers and the natural water table. In the last 40 years, the average lake fluctuation from spring to fall has been 40cm. Please take time to review the information posted on the Alberta Environment and Sustainable Resource Development Web Site. This site has some very important information related to aquatic invasive species that are travelling North into Canada on boats that have been taken south of Canada. Species such as Zebra Mussels is of great concern to Alberta Environment and Sustainable Resource Development and the Resortation Society.